Welcome back to my series on blogging that Ruth Feiertag asked me to write late last year. This is the third instalment, and today we’re talking about the important of including visual images in your posts. (There are links to the first two instalments at the bottom of this post). I’m going to be spend the vast majority of my time talking about the two specific types of visual images that I’ve seen used most often in the blogging world: photos and videos. If you can master these two options, you’ll go a long way in attracting and retaining new readers. How quickly did it take for you to notice the picture of the sliced citrus fruits I included in the beginning of this post? My attention was immediately drawn to the pink slice. I wondered if it was a dyed piece of lemon or if it was supposed to be part of a small grapefruit instead. A well-chosen picture or video is eye-catching. Ideally, it will encourage the reader to ask questions about what it is they’re seeing and experience your post in ways that wouldn’t be as likely if they were only staring at words on a page. If you’re writing a post about whipping up a batch of your top-secret chili recipe, it wouldn’t make any sense to include a photo of elephants alongside the ingredient list. In my opinion, it’s better to publish something that doesn’t contain any pictures at all than to shoehorn in images or videos that don’t actually fit the topic of conversation. This is something I’ve been guilty of in the past, and I know it has confused at least one of my readers. Do your best to avoid my mistake. Take as much time as you can to find pictures or videos that match the topic you’re discussing. Honestly, this shouldn’t even need to be said, but be sure to research and obey the copyright laws for your country. I’ve heard of multiple bloggers who were sued for using photographs and other creative works without permission. If you have any doubts about whether or not you’re allowed to use a specific work, find something else to fill that space instead or leave it blank. Assuming you don’t know the photographer or creator personally and haven’t received special permission to use their work, here are some of the labels you’ll want to look for when searching for photographs that you’ll be able to use for free on your site. As a general rule of thumb, the copyright on most photos and other works will expire 70 years after the artist’s death. Do not assume that every photo published after that date is free to use, however! Each country has their own laws on this topic, and sometimes those laws vary based on when the artist died. Always double-check what the rules are in your country before using any visual aides. It is also possible for an artist to forfeit their copyright claims if they wish. This means that you can use their work for personal or commercial reasons without needing to seek permission first or pay for the rights to use that photo. Public domain photos can be used for commercial and personal purposes. You don’t have to credit the photographer or provide a link to the site where you found it for this type of photograph. A Creative Commons License is a little more complicated. In general, photos that have this license can be used for free if you follow the rules the creator made for them. For example, they might ask you to provide a link back to their personal site, include the Creative Commons logo, email them for permission first, and/or take some other step to indicate that you are not the owner of this photo and you do have permission to use it. There are many free stock photo sites out there. Pexels is my favorite site for public domain photos due to their huge selection and high-quality images. Wikimedia Commons has a smaller and more historical selection of photos that are mixture of public domain and creative commons licenses. Finally, anyone who writes about TV shows or films should always check the IMDB page for the program they’re reviewing or discussing. There are often set photos, film posters, and previews on them that can be used in your review! I highly recommend all of these sites. No registration is required for any of them, and you are free to use as few or as many photos and other items from them as you wish. In all of my years of including pictures in my posts, I still haven’t run out of possibilities from these sites. They’re all updated regularly with relevant and interesting content. Sometimes I’ve also found wonderful stock photos by googling “public domain X photos,” where X stands for whatever topic it is I’m blogging about today. Be careful about double-checking the license for pictures if you go this route, though! Since I haven’t needed to sign up for any paid stock photo sites so far, I won’t give recommendations for or against any particular companies. I try to only give advice on topics I’m experienced in. The copyright for videos is both easier and more difficult than it can be for photos since so many videos out there were either intentionally created to be shared or may have been stolen from the original creator. On the positive side, I am seeing people becoming more diligent about finding the original sources for videos (and forms of art not relevant to today’s post like comic strips) than they were even a year ago. If I can’t verify who originally created a video or if the creator’s identity is disputed, I don’t share it. I work hard on my writing, and it’s only fair to give proper credit to other authors and artists, too. The vast majority of the time, the videos I share come from one of two sources because of how (relatively) easy it is to track down creators on them: Youtube and Vimeo. The other nice thing about them are their share buttons. If a specific video has that option disabled, it’s a sign that the creator doesn’t actually want you putting it on other sites. To repeat myself for a third and final time, don’t take my word on whether or not you can share something. I’m not a lawyer, and I don’t have the copyright laws from every single country on Earth memorized. Always do your due diligence and err on the side of caution if you’re not sure what the rules are. This has been a long post. To thank you for reading it, I’ll share one of my all-time favourite Youtube videos with you. As anyone who knows me has probably already guessed, it is rabbit themed! I really appreciate all the time and effort you’ve into these impressive posts. (The bunny jumping was pretty stellar too. )The information and links you’ve provided are great resources; I’ve just spent way too much time scrolling through the amazing photos on Pexel. I think you’re spot on about the way photos add to the interest of a post. Images also help, I think, to break up a long post and give the reader a momentary break. Sometimes that’s all we need to be ready to push on. Just to add to your reminder about relevance: I think it’s important to try to see the images we insert as our readers might. The connection we see between an image and a text might be obvious to us, but not to someone with a different background or who didn’t grow up in a family with a pet elephant who loved chili. The evolution of Creative Commons has interested me for some time now. I love the way the web site helps people decide just how far they want their sharing to go (https://creativecommons.org/choose/). Did you happen ever to read the YA novel, _The Shakespeare Stealer_? It’s a great reminder of how different our attitudes are now toward issues around intellectual property. So how DO you think that one lemon got its magenta hue? Dye? Photo editing? Embarrassment? Ot just tickled pink? You’re quite welcome. Thank you for giving me so many blogging ideas! I’ve never read The Shakespeare Stealer, but I’ll try to find a copy of it. That website you shared a link to was great, too. I’m saving it for future reference. My best guess is that the photo at the top of this post was altered by some kind of photo editing software after it was taken, although I have heard of people dyeing food for various purposes. For example, one of the people who worked on the set of the original Star Trek series once tweeted about how they added food colouring to fruits and vegetables to make them look alien for certain scenes on that show. 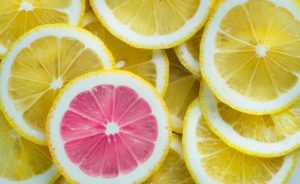 Why do you think that slice of lemon is pink? Also, would it be okay if I sent you a short email? Well, I suspect that there’s an Ugly-Duckling story to go along with the pink lemon slice. It probably was just born different and had to find a way to be accepted by all the other lemon slices. They look as if they’re all getting along famously now. This may explain the origins of pink lemonade. I should be pleased to get an e-mail from you. I sent you a message via Goodreads with my address. I like your explanation for the pink lemon slice, too.